You might have heard about TSA luggage locks and wondered why they are preferred over other luggage locks. Most of us prefer to lock our check-in bags. Locking our bags reduces the risk of opportunistic theft while the bags are out of our sight. All airport authorities have the permission to inspect our bags at their own discretion. Most countries scan check in bags and make the owner open it if they want to inspect the content further. However, in the USA, airport security staff can open all check-in luggages without involving the owners. This means that luggage locks are opened with force, often damaging the actual luggage piece in the process. If your bag is locked with TSA luggage locks, they can be unlocked with a master key and avoiding any damage to your luggage. This is why TSA luggage locks are preferred over other luggage locks if you are travelling to, from, or through the USA at any point of your journey. First - What Is TSA? TSA stands for Transportation Security Administration. TSA is a North American institution and was founded in the wake of 9/11 to strengthen the security of the USA transportation system. US Federal law mandate TSA to screen all check-in baggage. TSA luggage locks manufactures have an arrangement with TSA to supply the travelling public with TSA accepted and recognized locks. TSA screeners have special tools to open and re-lock TSA luggage locks without damaging the lock or the bag if a physical inspection is required. If your bag raises the alarm then TSA will open it for further inspection. That is not a problem if your luggage is unlocked or locked with TSA luggage locks. However, if you used unrecognized locks then the inspectors will break them to access your bag. This can cause damage to your actual luggage piece, though for soft-sided baggage, this process should not damage your zippers or zipper pulls. TSA does not reimburse passengers for unrecognized locks that have been broken as the result of the security screening process, or for any damage caused to locked bags that had to be opened for security purposes. There are three types of TSA accepted luggage locks available; key, dial, and keycard locks. These are usually the cheapest of the three types. You simply use a key to open the lock. The disadvantage is that if you lose your key, you cannot open it. In addition, if you have more than one bag, you will have different keys to each lock. When choosing a key operated lock, ensure it is TSA luggage locks. Buying travel accessories at the airport or train station will cost you more. We recommend you buy them in advance, either online or at your local travel store. These locks are usually with three dials, though there are some types that come with four dials. They are handy because you can reset the number combination used to open them. Therefore, if you have more than one lock for your luggage, you can set the same combination for all of them and you do not have to worry about losing any keys. Again, look for dial locks that are TSA accepted. These locks are very handy for those who have problems remembering numbers. They work in the same way as dial locks, except you choose a 4-letter word instead of numbers, with up to 10.000 letter combinations. These locks come with a key card, similar in size as a credit card, which you use to open them. This is similar to a hotel room keycard. They are very convenient to use because you do not need to remember the security code to open them, they open simply by swiping the card through them. You can keep the keycard conveniently in your wallet. Some suppliers do sell set of locks that operate with the same keycard. Though you do have the same issue with them as with normal key locks, if you lose your keycard then you cannot open them. 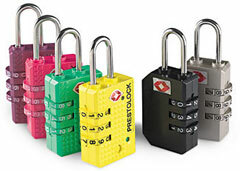 These locks are very convenient to use though and are our favorite type. Again, look for TSA accepted lock. The bottom line is that TSA luggage locks keep both your belongings save from theft and your bag from damage caused by security inspection when flying, though airline baggage handlers can of course damage your bags, which is another matter. We at Top Travel Tips therefore recommend you to purchase TSA luggage locks. We have had some of our luggage damaged beyond repair due to having wrong locks on the bags while flying in transit through the USA. You can buy TSA Luggage Locks online at Amazon. They offer very competive prices on all travel accessories like luggage locks.